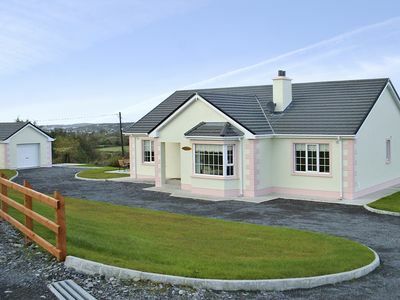 Welcome to our beautiful house on very quiet lane, near Ballaghaderreen, Castlerea, Knock Shrine and Airport. 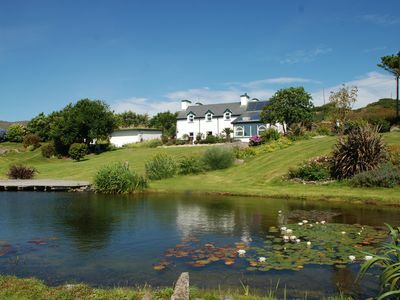 In warm location, near stunning lakes with swimming/fishing, 50 mins from coast. 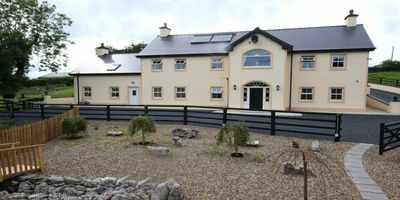 The house is tastefully furnished with 4 large bedrooms, one ensuite, two with king size beds; huge kitchen with lounge area; separate lounge with reclining leather sofas, cosy wood burner, large HD TV. Big garden/parking. Bikes/table tennis table. We offer substantial discounts on any stay of 7 nights or more, which will be reflected in the price quoted. 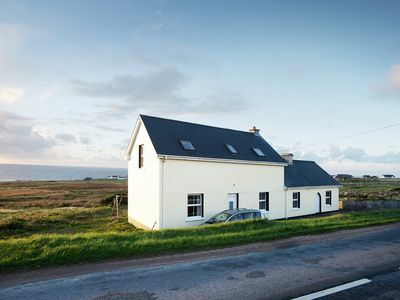 The beautiful house is very spacious inside, and can accommodate a large family or even two smaller families travelling and sharing together! 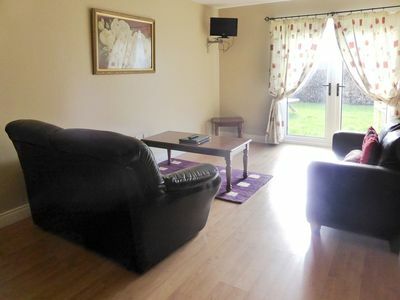 This is a well-equipped and sparkling clean property with your convenience and comfort in mind. We are committed to help you to have a fantastic holiday and will always be available to help you if needed. So far in 2018 we have advertised the property on another Internet platform and have received excellent reviews and on present trends are due to be given Superhost status by early October 2018. 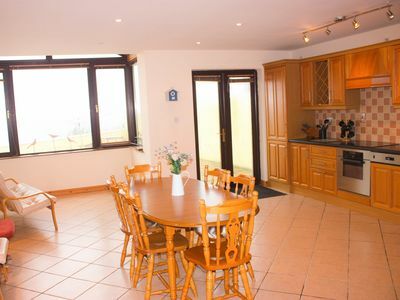 Inside, the house has been tastefully furnished, with a high standard of décor and fittings. There are lovely touches like the antique dresser in the hallway, the superb leather reclining sofas in the lounge that you'll never want to get up from, and the magnificent, decorated pine dresser in the kitchen, and the gorgeous wood burning stove, which gives a level of comfort unmatched by any open fire. The fabulous 28 foot-long kitchen has something of the 'wow' factor with many of our guests, is well-equipped and has a large sofa and chairs near to the south-facing windows. From the kitchen, there is a door that leads directly out onto the patio with picnic bench. In the south-facing lounge, there is a cosy wood burner with fully dried and seasoned wood available. There is a large HD TV with Saorview. There are books to read and childrens' toys available at your request. The large, luxurious bathroom is fully-tiled, with bath and separate shower cubicle. Bedroom 1 has a king-size bed with a high-quality Revlon mattress, an optional toddler bed, (which will be in the room only if needed)*, fitted wardrobes with full-length mirrors, coffee table and tiled ensuite power shower and WC. 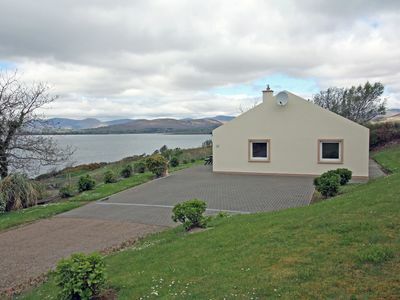 Scenic views to the rear garden and meadow. Bedroom 2 also has a king-size bed, another optional toddler bed*, fine fitted wardrobes, coffee table, and faces south for all day sunshine. Bedroom 3 has a double bed, pine wardrobe, chest of drawers and bedside tables with lamps, and also faces south. Bedroom 4 has two single beds, fitted wardrobes and faces across the extensive rear garden and meadow. There are 3-seater and 2-seater reclining leather sofas in the lounge and another large and comfortable sofa in the kitchen. 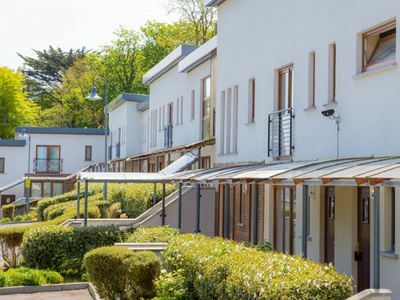 All bedrooms, as per the kitchen and lounge, have plenty of electric sockets, useful for charging appliances such as phones, tablets, laptops and toothbrushes. There is a utility room with extremely large fridge freezer, further worktops and a door to an additional WC. From the utility room, an external door opens directly into the large back garden with open views over the beautiful meadow behind. Being a bungalow, all rooms are easily accessible and this as a safe space for young children and those with limited mobility. *The toddler beds are suitable for children up to about 6 years old. A travel cot, crib, and child's high chair and double buggy/pushchair are available for you to use on request. Please try and give us at least a day's notice if you wish to use any of these during your stay. Outside there is a large garden bench, ideal for a breakfast or lunch in the sun and fresh air. 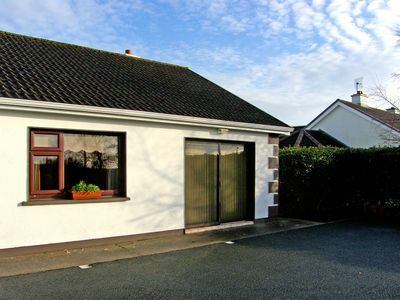 The rear garden is large, open and flat with well-kept grass and ideal for all ball games. There are 3 bikes available to use, but again please let us know at least a day before you arrive if you would like to use them. There is also a table tennis table with full accessories (net, 2 bats, several balls) available to use in the games room/garage, ideal if the weather is wet or cool. Most of our guests so far in 2018 have played table-tennis and had great fun doing so! The house lies on a quiet, leafy, lane with perhaps one or two vehicles per hour passing by, sometimes even less. 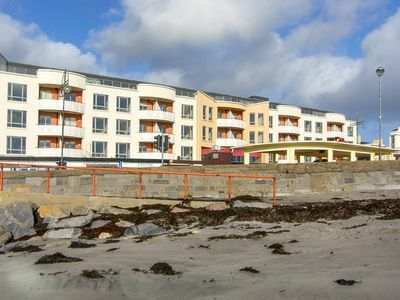 We believe that we offer exceptional value for a property of this quality. We welcome people from all backgrounds. 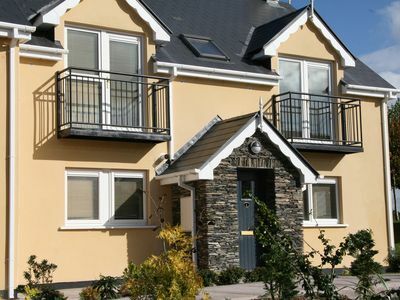 The house is located in the Irish Midlands, an area noted for its beautiful countryside, lakes and forests, where summer weather is often better, warmer and less breezy than that of coastal areas. Yet from here, if you wish, you can easily make a day-trip to the coast along very quiet roads. 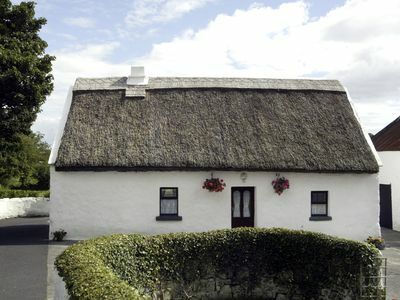 In fact, this area is typical of the best of rural Ireland. To the West and South-west are several beautiful and peaceful lakes, or loughs, which offer safe and free swimming, fishing and space for boating. One such lake is Urlaur Lough next to which is Urlaur Abbey just 8 miles to the west of the house. Urlaur Abbey is a monastic settlement founded in 1430 by the Dominicans. It is a must for all tourists as the Abbey has been remarkably well preserved. This remote and peaceful lake attracted the friars who came here from all over Connacht to spend their life following the rule of their Dominican order strictly. The austere vision of Saint Dominic is well reflected in the strong lines of the architecture. The Church is rectangular in shape with doorways in the western and southern walls, windows and three gothic arches. There is an aperture where lepers could rest and hear Mass. The Abbey also had other buildings such as the kitchens, the refectory, the boathouse for a quick escape and, up the steps, the dormitory where the friars slept. To the south there is Erritt Lough, and alongside it is Erritt Lodge. Erritt Lodge is now a public amenity open to all but only known locally. 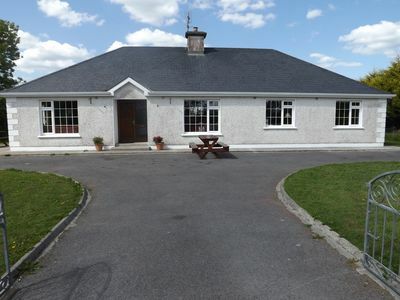 In the 19th Century Erritt Lodge was one of the West of Ireland's most famous sporting lodges often frequented by the upper classes and landed gentry of those times. During the summer, the lake is open to swimming and fishing. Kayaking on the lake is also offered. Only 5 miles from the house is Lough Adreen, a hidden gem of a lake, tucked away down a remote track and unknown, even to many locals. About 30% of the lake is in County Roscommon, 70% in County Mayo. 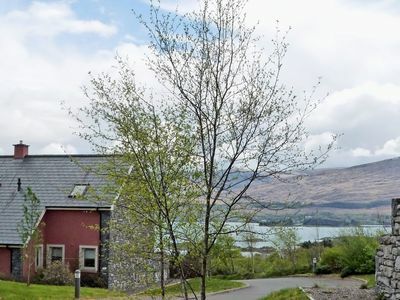 You will need to walk the last 400 metres or so to the lake, but once there, you will feel like you are in one of the remotest places in Ireland with the landscape frozen in time for several centuries if not millennia. In the broader area to the south of the house, the land is more forested and flatter, but will lots of small lanes and where scattered houses can appear from almost nowhere. 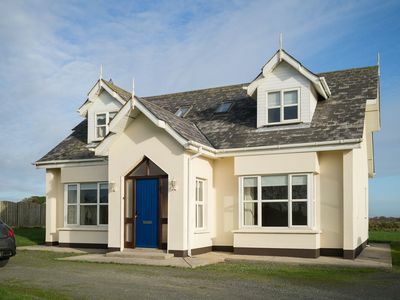 Not far to the north as you head towards Boyle or Sligo, are hills and more lakes with breath-taking views. 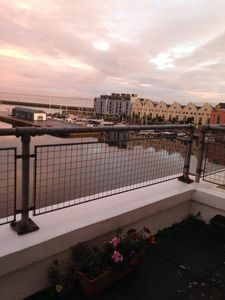 Not far to the north-east is the popular and bustling town of Carrick-on Shannon, on the main N4 road from Dublin to Sligo, and acts as a gateway to the north-west of Ireland. 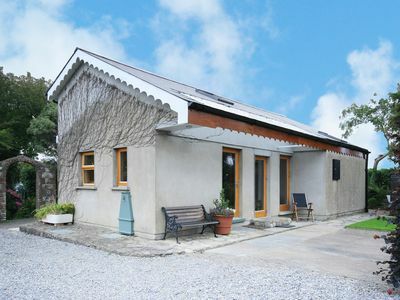 Generally in this part of Ireland the roads are very quiet, and the land is flatter, ideal for leisurely drives, biking or gentle to moderate walks. There are a few houses along the lane, some used occasionally as second homes. A few minutes away on foot, you come to ancient bog land and it can feel as if you are entering another world. A meandering river lies close by, and it's likely that you will be alone as you explore the peace and tranquillity. 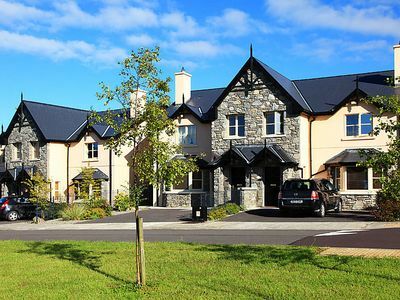 Ballaghaderreen, just 3 miles away, has a large supermarket, bank and many pubs, restaurants and shops. There is a large children's playground. Many thanks for reading about our listing. 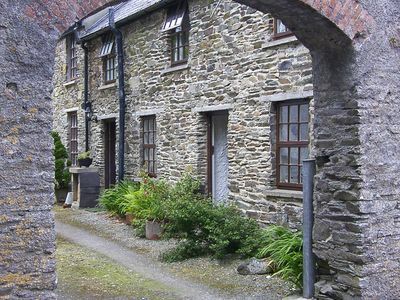 We will be delighted if you decide to book with us! 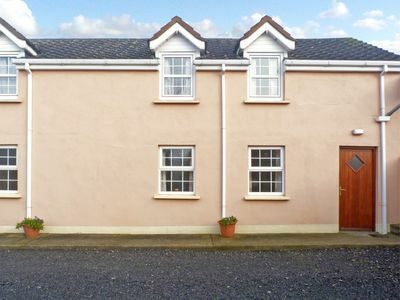 2 bedroom property in Carlow. Pet friendly. 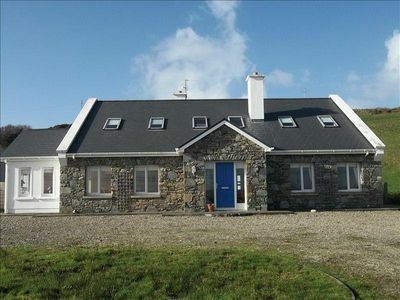 3 bedroom property in Kenmare. 'Sea Haven', with its Amazing Sea View, perched on the cliff side.